This year’s physics Nobel is all about light–matter interactions. One half of the prize went to the inventor of optical tweezers, Arthur Ashkin, while Donna Strickland and Gérard Mourou, the scientists who pioneered a method to generate high-intensity laser pulses, shared the other half. Their work has influenced many scientific fields, from revolutionising eye surgery to uncovering ultrafast reaction dynamics. In 1986, Ashkin was the first researcher to realise that tiny objects – from bacteria to individual atoms – could be trapped simply using high-powered light. 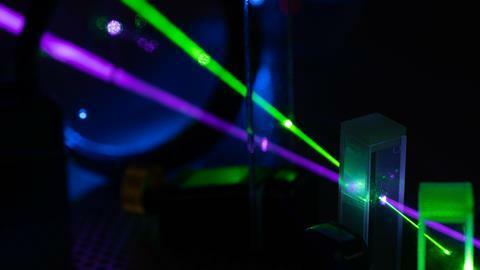 A focused beam of laser light exerts enough force to even grip and manipulate individual cells without harming them. 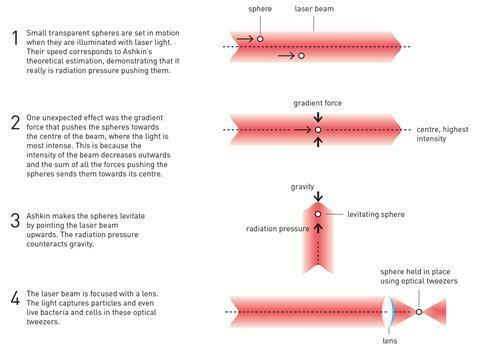 Soon after discovering optical tweezers, Ashkin and his colleagues used it to study delicate biological systems such as the protein kinesin. Using a laser-trapped polymer bead, they studied the force this walking motor protein can generate. The mid-1980s was also the time Strickland and Mourou made their revolutionary discovery. Although lasers were invented in 1960, their intensity – the number of photons that could be packed into each pulse – had barely increased in the following 25 years. Mourou and Strickland developed a technique called chirped pulse amplification (CPA) that overcame this problem and has since led to brighter, and shorter, laser pulses. In CPA, a short laser pulse is stretched in time to reduce its peak power, and then sent through an amplifier. Afterwards, it is compressed back to its original duration, creating a dramatically amplified pulse. ‘At this point [CPA] is used almost ubiquitously in many different ways,’ said Strickland, who was a PhD student when she made her discoveries, in an interview. Surgeons now use femtosecond lasers to correct near- and far-sightedness, and even higher powered lasers are being investigated as a cancer treatment. Ultrashort laser pulses have also opened up new ways to probe fundamental chemistry processes such as chirality and the way electrons move during reactions. ‘You don’t just want to talk to molecules and atoms, you want to influence them – this is something that started with the invention of the CPA technique; it was science fiction for a long time,’ said Mats Larsson, member of the physics Nobel committee, at the physics’ prize press conference. Being able to shove atoms around with light has also allowed chemists to precisely place atoms in arrays that could eventually be used for quantum simulations. Optical tweezers have become so sophisticated that they can hold individual atoms and bring them together to react. Lasers can even be used to bleed momentum away from speeding particles and cool them down to a thousandth of a degree above absolute zero. These extreme conditions allow scientists to observe chemical processes at their most simple, pinning down reactive intermediates or drilling down into molecules’ reactivity patterns. While this year’s physics Nobel prize has created methods that have found widespread use across the sciences, it has also re-ignited the discussion on the lack of women receiving science’s highest honour. Strickland is only the third female physics laureate, and the first since Maria Goeppert-Mayer received the Nobel in 1963 for discovering the atomic nucleus’s shell structure. The percentage of female nominees is still small, admitted secretary general of the Royal Swedish Academy of Sciences Göran Hansson at the press conference. ‘The number of nominations reflects the number of women in science two or three decades ago,’ added Olga Botner, chair of the physics Nobel committee. ‘We are taking measures to encourage more nominations because we don’t want to miss anyone,’ Hansson said, but pointed out that it is part of a long process that will take years to take effect.